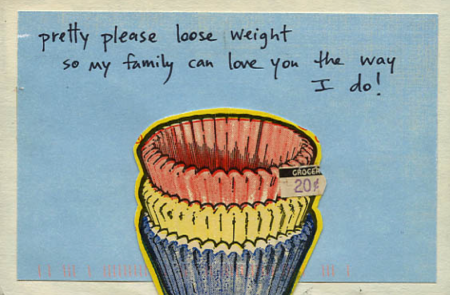 This postcard from PostSecret came up a couple of weeks ago while I was out of town. It made me sad and angry to see it. Pretty please loose weight so my family can love you the way I do! Firstly, I just wanted to smack the author of the secret upside the head. If you want someone to weigh less, you want them to LOSE weight, not LOOSE weight. Loose weight suggests that the fat is somehow not tight on the body. Maybe your beloved should break up with you just because you’re not smart enough to know the difference. Secondly, if you loved them just the way they are, it wouldn’t matter what your family thought. Deep down inside, you’ll only love them if they get thin like you think they should be. If you find yourself in this position, dump the person asking you to “loose” weight. They’ll never be happy no matter how thin you become. If you want to get healthy for yourself, that’s great. If you want to get healthy so you’ll live longer and be able to spend more time with your loved ones, that’s even better. If you want to lose weight just to earn love from the unworthy, then run away as fast as you can. Next: Don’t Feed The Stars? !